When Bonfire first came to my attention, I had to no idea what to think of it. All I knew that it was a mystery thriller written my Krysten Ritter. When I heard of Krysten Ritter, I knew she stars in Jessica Jones as the main lead, Jessica Jones. Although I am huge fan of the series (not so much for the other series), I had to wonder about the book or any of the times we know a celebrity who suddenly comes out with a book. Whether it is a memoir, autobiography, or a story, there seems to be some idea that one cannot cross into the other. I had that thought, but there was something that was telling me this was the perfect story to be written by Ritter and only Ritter. There was something that just made sense and I knew that somehow this would be able to work out. I was really surprised how I remained really interested throughout the story. It was the understanding of multiple things going at once and the suspicions towards everyone that kept everything going for me. I wanted everything to be revealed, but at a grand, intense finale. I knew that the ending was going to pull some insane twists and reveal everything, but sometimes you just need to be careful what to wish for. It was more insane than I thought (in a good way from a reader’s perspective). Although I was intensely interested in the story, I have noticed for few things that I kind of wished wasn’t in the story in the first place. Firstly, the unknown breath. *gasp! * That’s right, Ritter did the “thing.” The “thing” we love to hate. That dreaded unknown breath. It wasn’t a big deal for me, but I thought I would just mention it briefly. I also wasn’t feeling the romance in the story. It felt somewhat forced. In my perspective, it seemed fine, but the forced part was the love triangle. To me, it just seems that something was needed and that is when the love triangle came in. I believe this was not needed at all. Perhaps the past history could have stayed the same, but the present day could have just ignored it. I have to believe this a great debut for Krysten Ritter and I can’t wait to see what the future has in the store for her and her books. 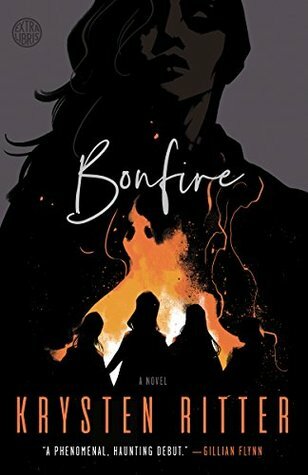 If the next books are going to be just as good as Bonfire (and even better) than I know I am going to like each one of them. I even want a movie made and have Krysten Ritter star as Abby. I know for sure I would watch it. It is definitely intriguing. Next ›The Sunday Post – A Happier Week! I like this cover way better than the original.